Our tables are handcrafted within the family and carefully handled each and every event to retain their original beauty. 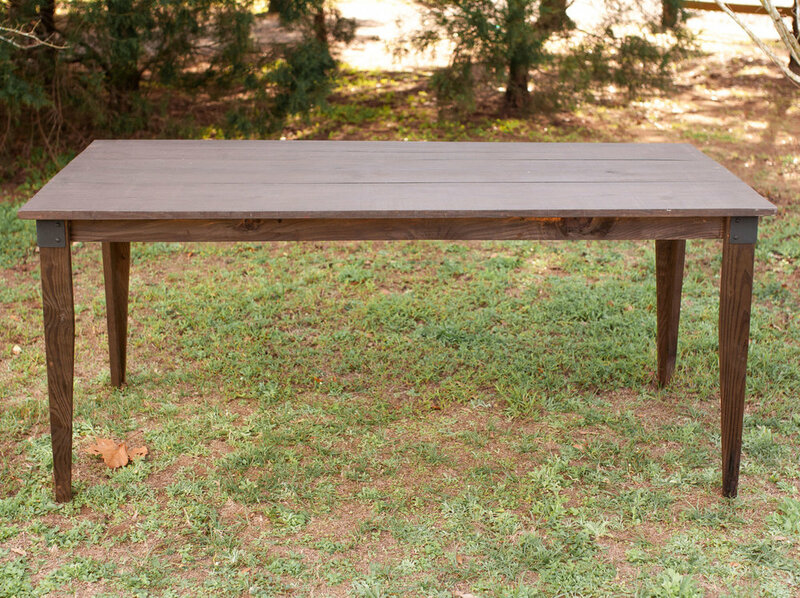 You could say our farm tables are dear to our hearts. Guaranteed to add a little bit of rustic charm to any event. They are built from heart pine with special attention to detail. Designed to enjoy a more natural finish, they are stained and sealed without a super glossy lacquer finish giving them a more matte appearance. Available in 6x3, 8x4 and a smaller 5 ft sweetheart table size. Our 6x3 ft tables can also be transformed into low boho style tables. Our 8 ft tables are great alone or in rows. With a width of 4 ft, you’ll have plenty of room for all the florals and decor you want. They seat 8 on the sides, and 10 if you use the ends. If you’re looking for seating, we also have folding chairs available that look lovely with our tables. Click the image above for more detail photos. For more information on pricing please contact us. Our 6 ft tables seat 6 per table. They are most commonly used in long rows, but also look great alone or as a sweetheart, welcome or cake table. We have enough 6 ft tables to seat large wedding of 250+. Our 6ft tables have the option of both bench seating or folding chairs. Click the image above for more detail photos. Also available with smaller legs for a low boho style table. See them in action! Click below for more.